Guanyin is an extremely popular Goddess in Chinese folk belief and is worshiped in Chinese communities throughout East and South East Asia. Guanyin is revered in the general Chinese population due to her unconditional love, compassion and mercy. She is generally regarded by many as the protector of women and children. By this association she is also seen as a fertility goddess capable of granting children. An old Chinese superstition involves a woman wishing to have a child offering a shoe at a Guanyin Temple. Sometimes a borrowed shoe is used then when the expected child is born the shoe is returned to its owner along with a new pair as a “thank you” gift. 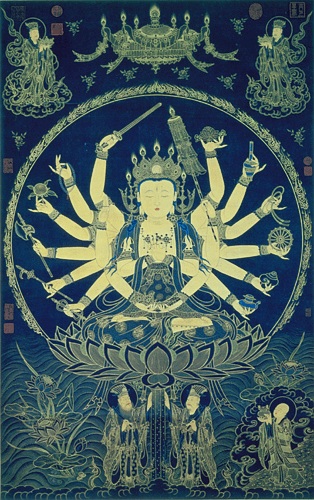 Guanyin is also seen as the champion of the unfortunate, the sick, the disabled, the poor, and those in trouble. Some coastal and river areas of China regard her as the protector of fishermen, sailors, and generally people who are out at sea, thus many also come to believe that Mazu, the Daoist goddess of the sea, is a manifestation of Guanyin. Due to her association with the legend of the Great Flood, where she sent down a dog holding rice grains in its tail after the flood, she is worshiped as a rice goddess. In some quarters, especially among business people and traders, she is looked upon as a Goddess of Luck and Fortune. In recent years there have been claims of her being the protector of air travelers. According to the story, a king asked his daughter Miao Shan to marry a wealthy man who is not caring, she told him that she would obey his command, so long as the marriage eased three misfortunes. When her father asked who could ease all the above, Miao Shan pointed out that a doctor was able to do all of these. Her father grew angry as he wanted her to marry a person of power and wealth, not a healer. He forced her into hard labor and reduced her food and drink but this did not cause her to yield. In one version of this legend, when she was executed, a supernatural tiger took Guanyin to one of the more hell-like realms of the dead. However, instead of being punished by demons like the other inmates, Guanyin played music and flowers blossomed around her. This completely surprised the head demon. The story says that Guanyin, by merely being in that hell, turned it into a paradise. Finally in desperation he used his hands. Miao Shan, realising the fate the executioner would meet at her father’s hand should she fail to let herself die, forgave the executioner for attempting to kill her. It is said that she voluntarily took on the massive karmic guilt the executioner generated for killing her, thus leaving him guiltless. It is because of this that she descended into the Hell-like realms. While there she witnessed first hand the suffering and horrors beings there must endure and was overwhelmed with grief. Filled with compassion, she released all the good karma she had accumulated through her many lifetimes, thus freeing many suffering souls back into Heaven and Earth. In the process that Hell-like realm became a paradise. It is said that Yanluo, King of Hell, sent her back to Earth to prevent the utter destruction of his realm, and that upon her return she appeared on Fragrant Mountain.